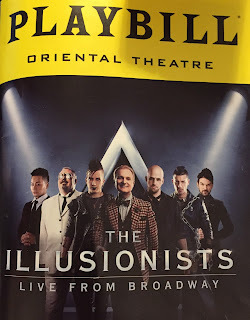 We saw the Illusionists on Tuesday night at the Oriental Theatre, and it is a fun and mystifying evening at the theatre. It bills itself as the "Cirque du Soleil of Magic" and I don't think I'd go that far, but the show is very entertaining. The basic concept of the show is simple. 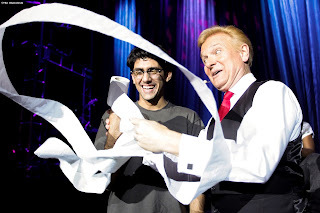 Rather than have one magician come and do a 2 hour show of all different kinds of magic, let's bring a number of magicians together and they can each do 20 minute bits, featuring their speciality. 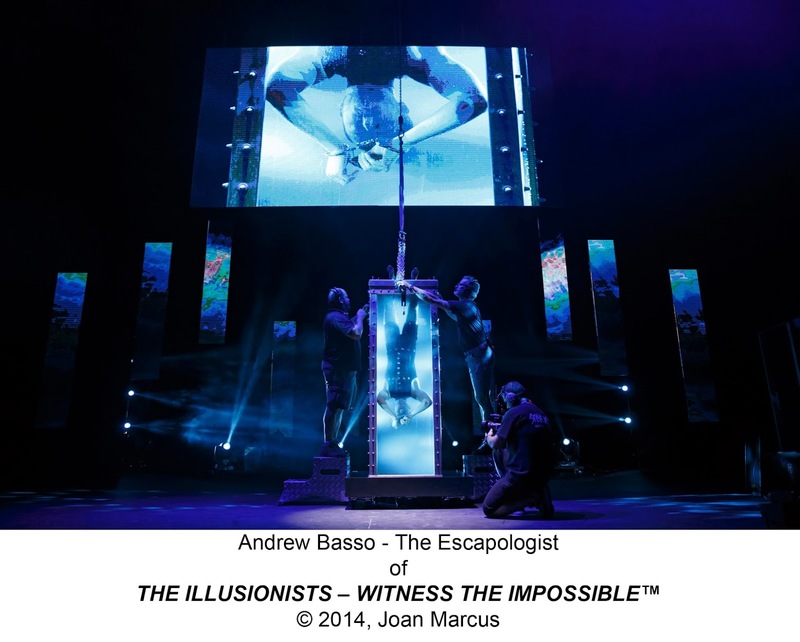 With that in mind, they have cast 7 magicians to put the show together, added 4 or 5 dancers/helpers, and made the show. Each of them was quite good at their speciality, with Jeff Hobson serving as the MC. 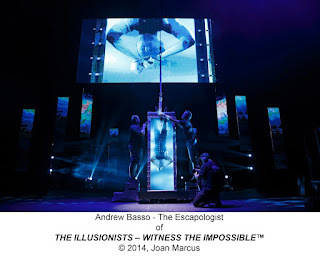 Two particular favorite acts of mine were Colin Cloud doing a mind-reading/mentalist act and Andrew Basso performing Houdini's famous water torture cell. Colin ended up guessing/naming people's birthdates, telling seemingly random people the name of the person they came with, and ending with a set of suggestions from people (asking for a celebrity, a city, and a household item) that ended up already being printed in the program! And Andrew's act of escaping while holding his breath (underwater, upside down, in full view of the audience) was nothing short of thrilling. Other acts were well done, and it seemed a little bit like a family affair. Hobson was funny, coming off as everybody's favorite gay uncle, with a slick Las Vegas style of friendly charm and lots of innuendos. Kevin James was your other uncle, all around nice guy, showing off his magical inventions (including one that involves chainsawing someone in half.) Sperry was the punk rock cousin, very brusque and from New York, doing a set of sideshow stuff, being hilariously rude to a volunteer, and ending with a bird act that was very nicely done. Jonathan Goodwin was your sister's uber cool boyfriend. He did a crossbow act which included a blindfolded shot that nearly decimated his assistant. Toilet paper routine by Jeff Hobson. You have probably seen this before. 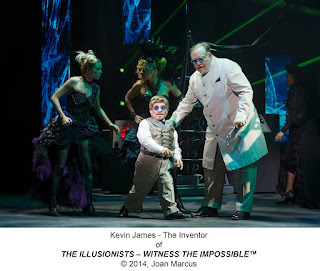 I said earlier that I wouldn't go so far as calling them the Cirque du Soleil of magic, because unlike Cirque there wasn't a lot of innovation going on. Many of these acts are classics. I've seen acts like these many times before, including a napkin disappearing act that Hobson did that we had literally seen at a birthday party about 3 months ago. But not everybody is as well-versed in magic as I am, and everything was well-performed and entertaining and causing amazement. Overall, I definitely recommend this show. I do want to warn that there are some innuendos that will probably go over your kid's heads. There's a bunch of slightly more adult humor than the suggested age range 5-105 would warrant. Still, my 8 year old loved it, and I don't think he got veiled sexual references. At least, I hope not! Tickets for THE ILLUSIONISTS at the Oriental Theatre range from $16-$80. A select number of premium tickets are available for many performances. Group tickets for 10 or more are available by calling Broadway In Chicago Group Sales at (312) 977-1710. Tickets are available at all Broadway In Chicago Box Offices (24 W. Randolph St., 151 W. Randolph St., 18 W. Monroe St. and 175 E. Chestnut), the Broadway In Chicago Ticket Line at (800) 775-2000, all Ticketmaster retail locations and online at www.BroadwayInChicago.com.